A native of Milan, Michele Safra, ASID, Allied was virtually swaddled in Fortuny and Dupioni silks at birth, thanks to her mother, an interior designer. Branded as the brainy one in the family, young Michele earned her degree in Business Administration and was pushed to become a financial advisor. But, even as she studied voraciously and excelled in the world of numbers, Michele was busy absorbing the world of beauty, learning how to fashion homes in Paris, Brussels, Geneva and Monte Carlo at her mother’s side. Even though her financial career was on the fast track, Michele heard the irresistible call of her artistic muse. Throwing caution to the wind, she dared to follow in her mother’s footsteps to pursue a career as a top interior designer. She turned her sights to design, earning her degree from the New York School of Interior Design and soon founding her company, Michele Safra Interiors. Michele Safra Interiors is one of New York City’s hottest boutique interior design firms, with Michele leading the company as she builds out her career as a top interior designer for the New York City area. Michele’s artistic roots, global upbringing, and financial expertise give her a distinctive blend of creative, cultural and business sense that’s not often found in the design world. An allied member of ASID, Michele has developed an international clientele for both residential and commercial projects. When she isn’t scouring European flea markets and exclusive showrooms, she can be found doting on her family in New York City. 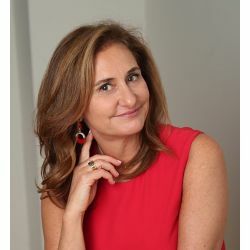 With a multicultural background and a flair for the eclectic, contemporary, and timeless, Michele Safra is dedicated to helping clients create beautiful spaces that resonate with their own unique spirit.